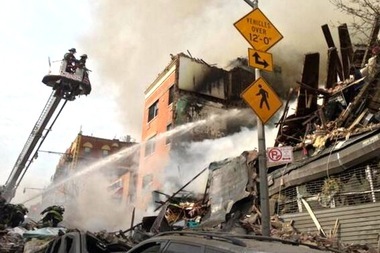 This is what was left of 1644 and 1646 Park Ave. after an explosion about 9:30 a.m. March 12, 2014. EAST HARLEM — One of the two buildings that collapsed in a deadly gas explosion on Wednesday morning had a new gas line installed last summer — and locals complained of a lingering smell of gas in the area for at least the past several weeks. The Department of Buildings issued a permit in June to install a 120-foot-long gas pipe at 1644 Park Ave., which houses the Spanish Christian Church on the first floor and apartments above. The pipe ran from the cellar, through all five floors of the building, according to DOB records. Minutes before a blast leveled 1644 and 1646 Park Ave. at roughly 9:30 a.m., killing three women and leaving dozens of other people hurt, a neighbor called Con Edison to report of a gas smell on 116th street at 9:13 a.m., officials said. Con Ed dispatched a crew, which arrived right after the explosion, they said. Con Edison CEO John McAvoy and Mayor Bill de Blasio said there were no earlier warnings to avert the blast. But neighbors and those who lived in the buildings told reporters that there had been a strong smell of gas on the block for weeks, including the night before the explosion. Jennifer Salas, 20, who told The New York Times she lived in one of the collapsed buildings with her husband, said they smelled gas in their building Tuesday night. “Last night it smelled like gas but then the smell vanished and we all went to sleep. We tried to find the source of the gas but since the smell left, we all went to sleep,” Salas told the Times, as she asked FDNY firefighters to find her husband, who was missing as of noon. Asked about complaints of a previous gas smell, de Blasio said, "We'll check into that." "There's always been a gas smell there." And a construction worker who is helping build a new apartment tower at Park Avenue and East 118th Street said he had smelled gas near 116th Street for the past two weeks. "Put it like this," said the worker, who declined to give his name. "I smoke cigarettes. When I walk by, I wait till I pass by till I start smoking." FDNY Commissioner Sal Cassano said it was too early to say what caused the explosion because the fire was still raging hours later and it was unsafe for fire marshals to get close enough to investigate. It was not immediately clear whether the new gas line at 1644 Park Ave. played a role. A permit was issued to contractor John Orlando Jr. of Brooklyn's New York Heating Corp. on June 5, 2013, and the work was completed on June 21, according to records and Acting DOB Commissioner Thomas Fariello. Orlando did not immediately respond to a request for comment, and the Spanish Christian Church, which owns the building, could not immediately be reached for comment. Con Edison said that they cut gas to one of the apartments in the building from May 17 to July 3, 2103 while a private contractor repaired a small gas leak. "Right now we don't know if our gas pipes were leaking," the utility's spokesman, Edward Foppiano, said. He said that Con Ed workman were last on the block on Feb. 28 taking a survey, but did not detect any gas leak. Wednesday's explosion also destroyed 1646 Park Ave., which housed Absolute Piano on the ground floor and apartments above. The building had been hit with a series of violations, including one from the Department of Buildings and more than a dozen from the Department Housing Preservation and Development, records show. In 2008, DOB inspectors found large vertical cracks on the back of the building, prompting them to issue a violation to the former owner for failing to maintain the structure. The former owner paid a $1,335.84 fine but the DOB never determined that the problem was corrected, a DOB spokeswoman said. More recently, the Department of Housing Preservation and Development slapped 1646 Park Ave. with more than a dozen violations for issues including missing or broken smoke detectors and blocked fire escapes, records show. The building's current owner, Kaoru Muramatsu, who also owns the piano store, did not immediately respond to an email requesting comment.